Tom Holland as Spider-Man stars in a scene from the movie "Spider-Man: Homecoming." The Catholic News Service classification is A-III -- adults. The Motion Picture Association of America rating is PG-13 -- parents strongly cautioned. Some material may be inappropriate for children under 13. NEW YORK — There’s much to like about the vibrant comic-book adaptation “Spider-Man: Homecoming” (Columbia). Besides an unslacking pace and a clever central plot twist, there’s the fact that the mayhem on display is kept virtually bloodless. And the film showcases both loyal friendship and restrained romance. As detailed below, however, some of the dialogue places this summertime diversion off-limits for the many youngsters who would otherwise likely enjoy it. That said, at least some parents may consider it acceptable for older adolescents. 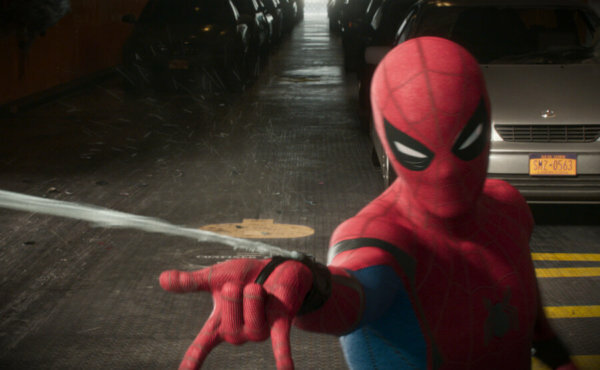 With 33-year-old Andrew Garfield, star of the last two Spider-Man films, having presumably outgrown the persona of eternally 15-year-old Peter Parker, and with a relatively new collaboration between Sony and Marvel Comics now controlling the character, it’s time for some changes in the longstanding franchise. So Tom Holland steps into the shoes — make that boots — of the world’s most famous web-slinger, and we start the story afresh. Some elements of Peter’s familiar saga endure. Thus, he continues to lead a double life in an effort to keep his extra-curricular crime-fighting activities concealed from his easily worried guardian, Aunt May (Marisa Tomei). While she provides him with guidance in everyday life, as tipped in last year’s “Captain America: Civil War,” Peter’s alter ego has acquired a mentor in the person of industrialist Tony Stark, aka Iron Man (Robert Downey Jr.). Peter also has developed a new ambition: he yearns to secure a place among the elite Avengers with whom he mixed in that 2016 outing. Given his youth and inexperience, Stark urges Peter to focus on thwarting petty neighborhood misdemeanors. But an irresistible target of a very different kind emerges when Peter stumbles across the dangerous schemes of mechanically winged villain Adrian Toomes, aka the Vulture (Michael Keaton). Toomes is busy selling high-tech weapons on the black market, and has no intention of having his commerce interfered with by Spidey. In between nocturnal battles with the bad guys, Peter prepares to lead his school’s team at an academic decathlon to be held in Washington. Teammates include his best pal, Ned (Jacob Batalon), and Liz (Laura Harrier), the senior for whom sophomore Peter pines. Director and co-writer Jon Watts crafts a lively and satisfying action adventure. But — as typified by the male-body-part nickname taunting fellow student Flash Thompson (Tony Revolori) saddles Peter with, and incites a crowd to chant repeatedly — the collaborative script (on which Watts worked with five others) is unfit for kids. That’s too bad since they’ll be missing out on quite a bit of fun. The film contains much stylized violence, including gunplay and a beating, a single gruesome image, brief sexual humor, a couple of mild oaths, two implied but unspoken rough terms, a few crude and several crass expressions and an obscene gesture. The Catholic News Service classification is A-III — adults. The Motion Picture Association of America rating is PG-13 — parents strongly cautioned. Some material may be inappropriate for children under 13.